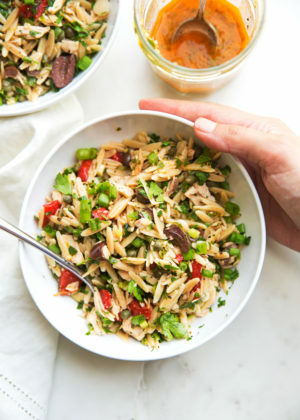 chickenLearn how to make a crispy chicken salad that’s drizzled with sriracha honey bbq dressing! The chicken tenders are perfectly juicy and tender on the inside with that crispy panko crust on the outside. 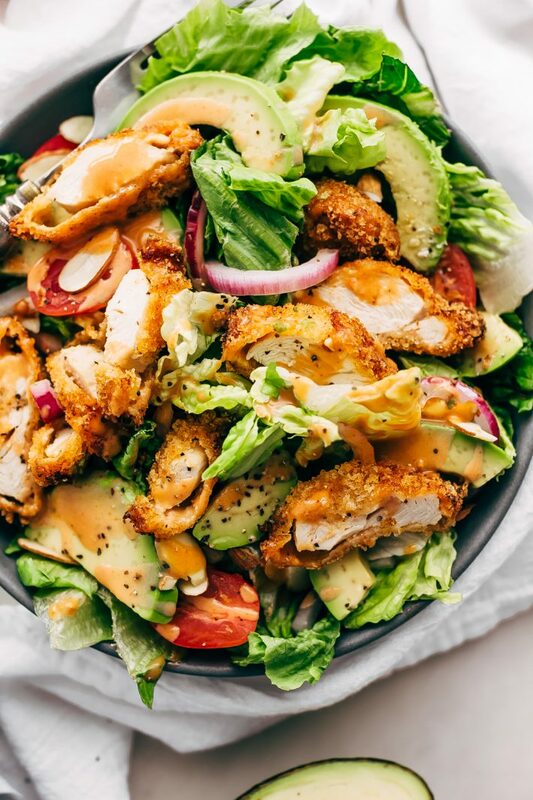 You’ll love this easy crispy chicken salad! 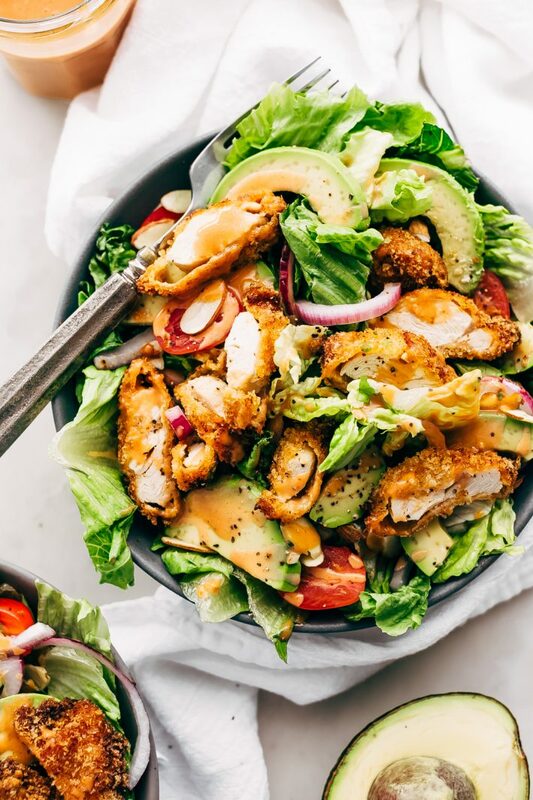 And we’re kickin’ Monday off with a crispy chicken salad! Here’s the salad I shared with you guys on Instagram last week and promised that it was coming very soon. It’s fresh. It’s got homemade crispy chicken tenders. It’s loaded with dressing. I’m pretty sure it’ll please even the significant others that don’t care for salads. What I love about this salad is that it defies the general norms of what we think of when we think salad. You know, greens, low-calorie toppings, grilled chicken, shrimp or fish. Ours is a whole different beast. It starts with homemade breaded chicken tenders. Load a bed of romaine up with sliced avocados, a few sun-ripened cherry tomatoes, and a few shavings of red onions for a kick. Then comes the fun part. A generous (maybe a little too generous sometimes) drizzle of my homemade sriracha honey bbq dressing. Just like that, you have a homemade crispy chicken salad that tastes better than anything you’d get at a fast food restaurant. It’s a real salad, for real people who are feeling really burnt out on salads. You feelin’ my drift here? I don’t know about you, but lunches and dinners seem to get boring around here sometimes. You know when you make something way too many times and your burnt out and just looking for something NEW? I mean, we keep things light around lunchtime with a salad of some sort, but when you make the conscious decision to have salads for lunch 365 days out of the year, they seem to feel pretty monotonous, day in and day out. So to liven things up a little bit, I decided we needed a crispy chicken salad topped with sriracha honey bbq dressing. And guess what? 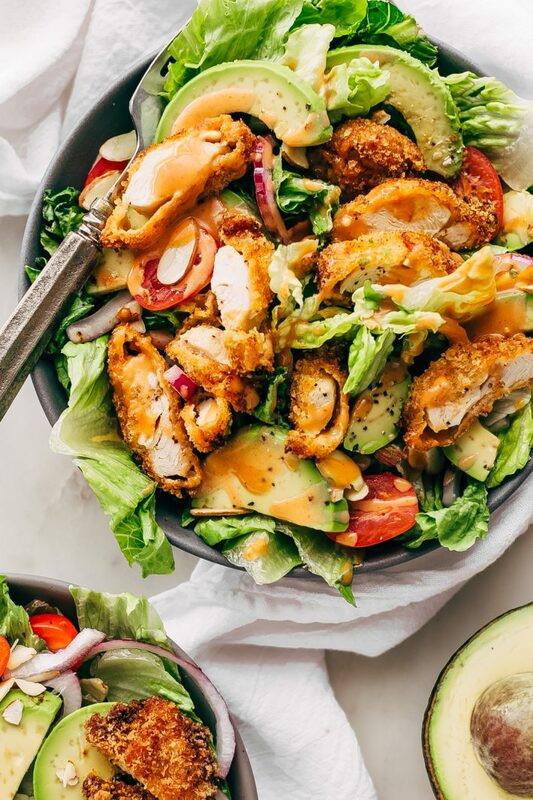 This salad is not only so satisfying from all those crispy chicken chunks, but it’s also loaded with the most addicting dressing! A little iceberg lettuce for crunch. A handful of sliced almonds, because why not? Anees has asked for the bbq dressing to be made on the regular. I couldn’t agree more! We’re going to put it on just about everything! 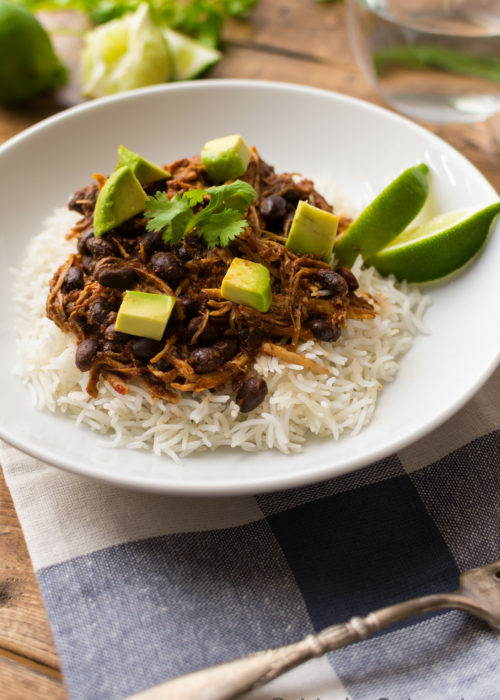 It’s seriously the perfect balance of spice, sweet, and smoky bbq goodness. 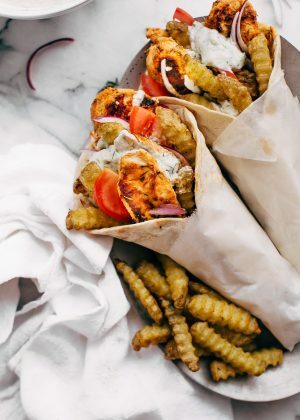 The sriracha honey mustard dressing plays a two-part roll. First, it flavors the chicken tenders as they hang out in the buttermilk. And second, we’ll use the remaining sauce as the dressing on our salad. 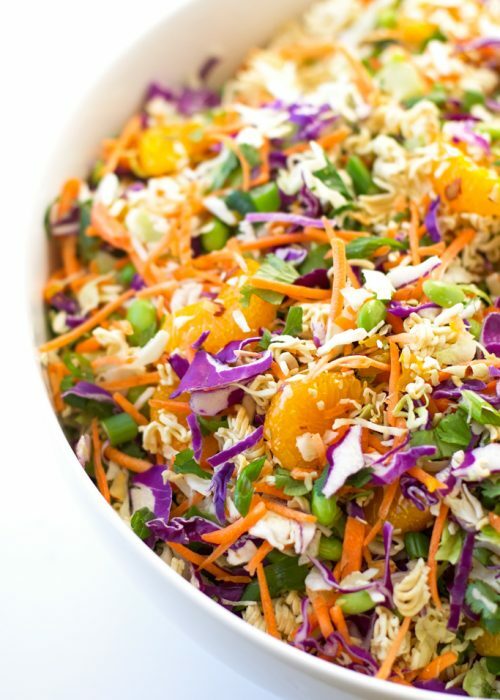 To make the dressing, you’ll need a little bbq sauce, honey, sriracha, mustard, mayonnaise, and apple cider vinegar. 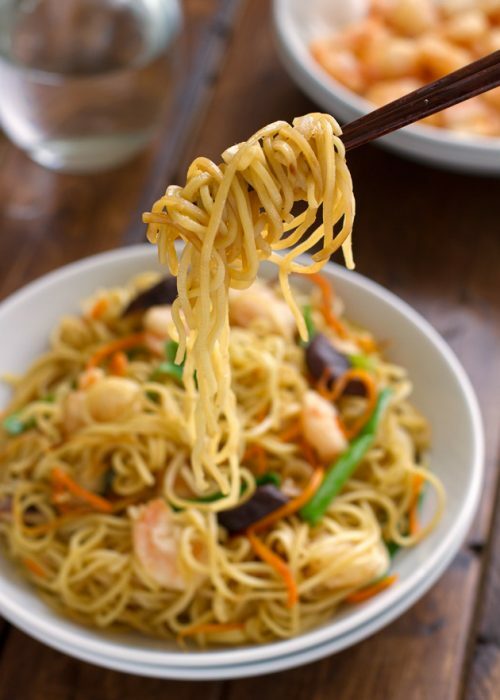 Combine it all in a bowl with a whisk, no need to get the blender out or anything! Have you ever used mayonnaise to marinate meat or poultry? If not, you’re in for a big surprise! It’s something that I picked up from my mom, and it’s her key ingredient in homemade Persian chicken kebabs. The mayo tenderizes the chicken to the point where it just melts in your mouth. Holy deliciousness! Ever since then, I’ve been using it in my grilled chicken marinade and the tenders for today’s crispy chicken salad. 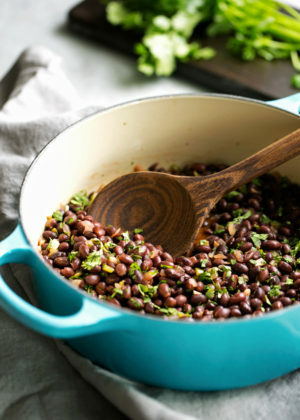 Use a cast iron skillet: my cast iron skillet (affiliate link) is one of my favorite kitchen workhorses. 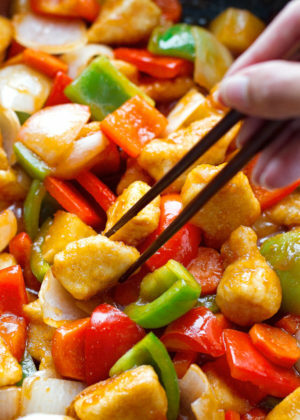 A thick skillet will retain the heat and fry the chicken more evenly, so you don’t need a deep fryer for this recipe. In fact, I almost encourage you not to ever get one! Use a meat thermometer: When you’re frying the chicken tenders, make sure they reach an internal temperature of 165 degrees. I highly suggest investing in a digital meat thermometer (affiliate link) as it takes all the guesswork out of it! Just insert the thermometer into the thickest part of the chicken (making sure only to go ½ way through) and let the thermometer read it for you. The chicken tenders will take anywhere from 5-9 minutes to cook all the way through depending on the thickness. Don’t use an oil that has a low smoke point: olive oil is not your friend when you’re frying chicken tenders. Instead, use peanut oil, canola, corn or vegetable oil for best results. And there it is – homemade crispy chicken salad. 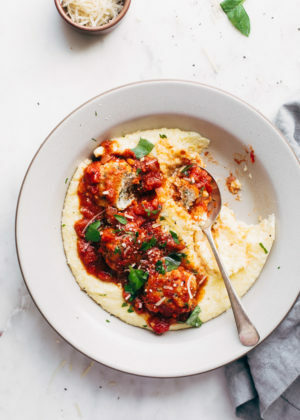 You can put it together for dinner or lunch anytime during the week. I sometimes like to make the dressing, toss the ingredients for the chicken marinade together in a zip-top bag, add the chicken and freeze it immediately. 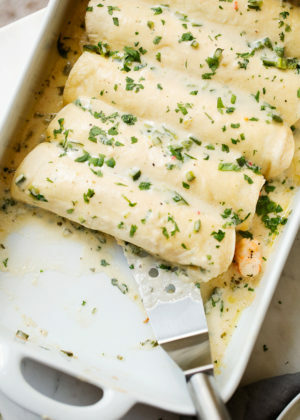 Pull it out closer to the middle of the week and let it defrost in the refrigerator overnight. It’ll marinate the chicken as it defrosts! All that’s left to do is dredge/fry the chicken. Then just toss the salad together. 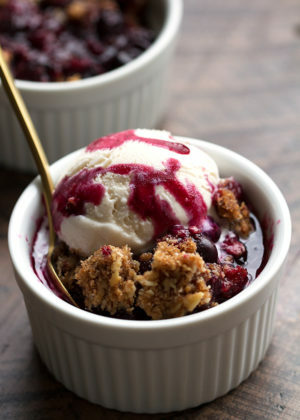 Another reason why I love today’s recipe is that it will please parents and children alike. I’m sure there are more than a few parents out there who have the hardest time getting their kids to eat anything green. Here you can pop a couple chicken tenders on their plates and some of that homemade sauce and continue building a salad for yourself. One meal that’ll please the whole family. Not only are homemade chicken tenders a 1000 x healthier than the store-bought alternatives, they’re also a lot more delicious! 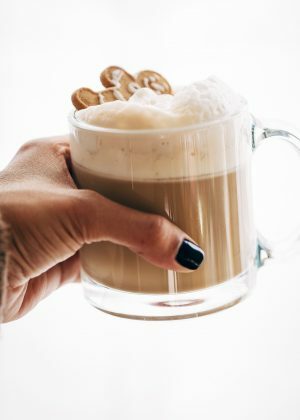 Make this! 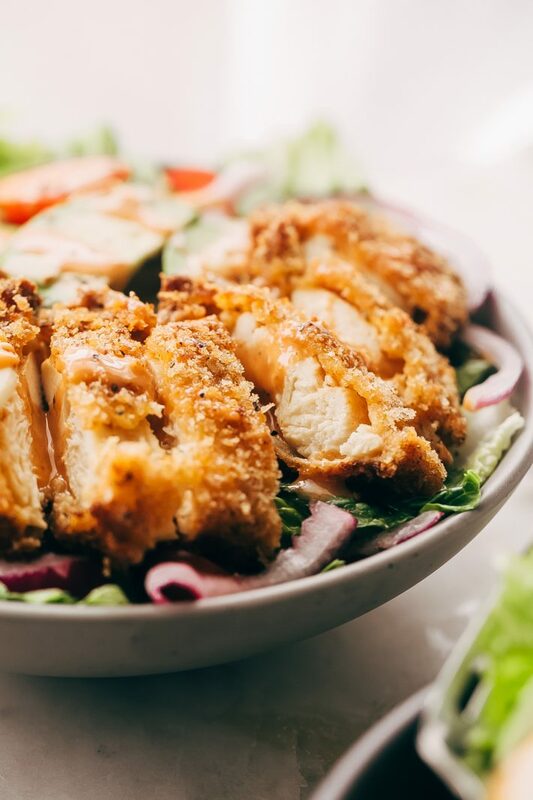 You need a crispy chicken salad in your life! 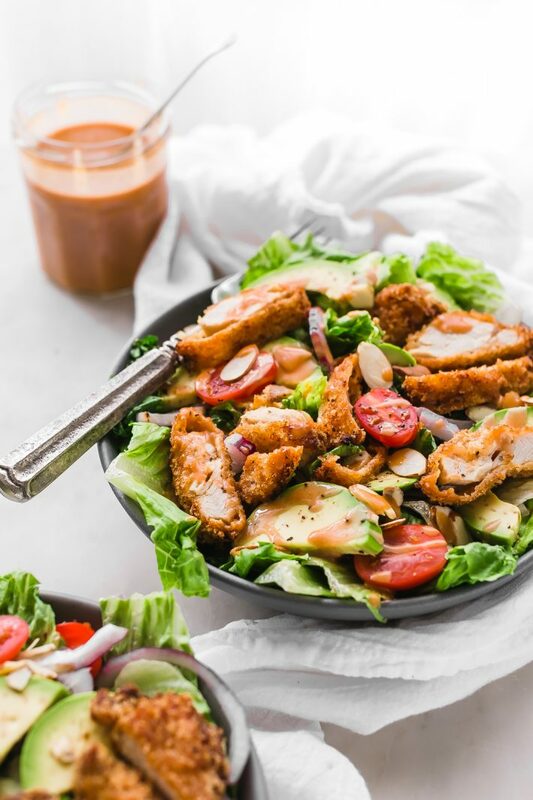 Learn how to make a crispy chicken salad that’s drizzled with sriracha honey bbq dressing! The chicken tenders are perfectly juicy and tender on the inside with that crispy panko crust on the outside. 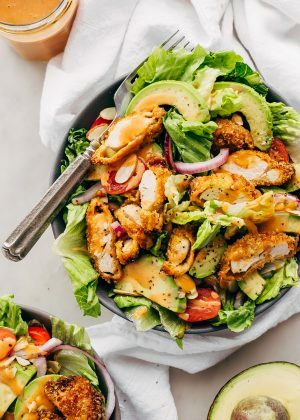 You’ll love this easy crispy chicken salad! 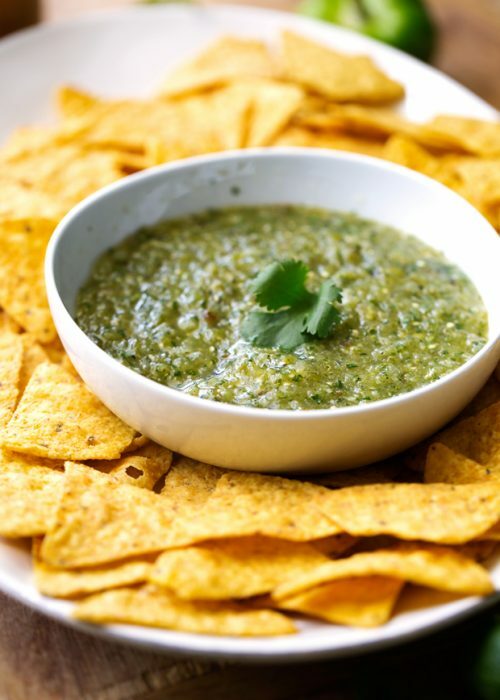 DRESSING: Whisk the ingredients for the dressing along with a big pinch of salt and black pepper. Continue to whisk until you’ve got a smooth dressing. PREP: When you’re ready to cook the chicken, Combine the flour, garlic powder and the smoked paprika in a shallow baking dish, in another one, combine the panko and the parmesan cheese and set them side by side. We’re going to set up a dredging station. 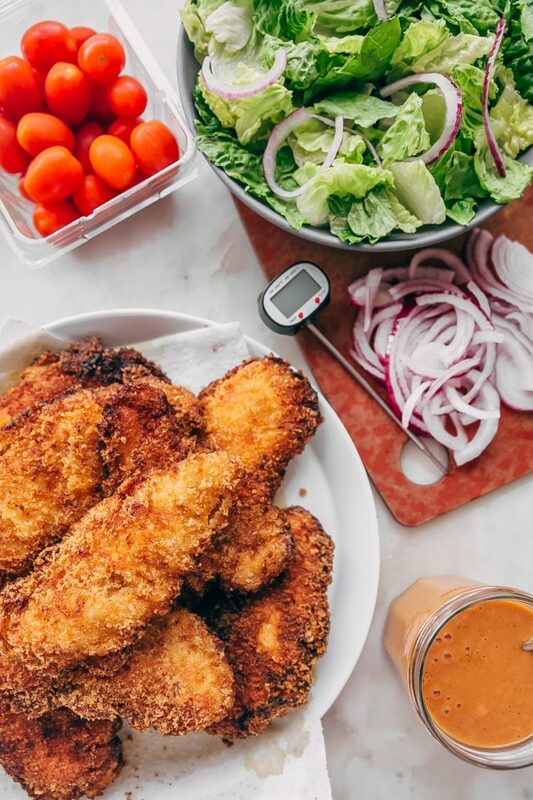 Start by removing a chicken tender from the marinade and allow the excess to drip off, then dredge the strip into the flour mixture, then the beaten egg, then the panko mixture and place the tenders on a clean baking sheet. Repeat with remaining tenders. 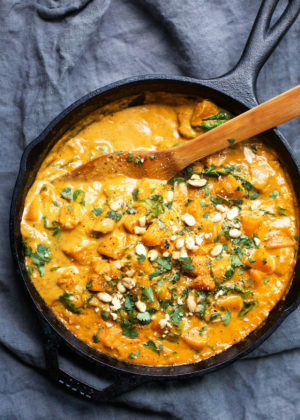 COOK: Add about an inch to an inch and half of the oil to a cast iron skillet (or anything you usually fry stuff in) and allow the oil to heat up on medium-high heat. Once then oil is hot, add a few tenders and allow them to fry for 5-9 minutes, flipping as required to cook the tenders all the way through. Remove to a plate lined with a paper towel and continue to fry until done. Slice the tenders into pieces or chop them up. ASSEMBLE: Add the greens to a large bowl, top with cherry tomatoes, sliced onions, avocados, sliced almonds, and add the chicken on top. You can also just make individual bowls if you didn’t want to serve this family style. 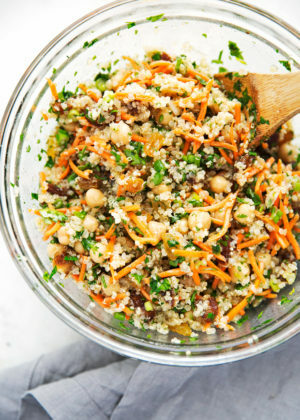 Drizzle with the dressing and serve immediately! I suspect that you could possibly cook these tenders in an air fryer but I haven’t tried it so I can’t say with certainty! If you give it a try, would love to know how it went for you! Haven’t tried baking the chicken tenders so, unfortunately, not sure at all how that would go!